Subdivision and condominium development and corporate and securities law experts. 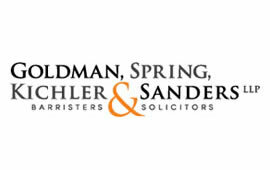 Founded in 1982, Goldman, Spring, Kichler & Sanders LLP is a leading boutique law firm in Toronto, maintaining a reputation for providing exceptional legal services in the fields of condominium and subdivision development, land acquisitions, joint ventures, commercial development and leasing, financing and other matters pertaining to the client’s real estate needs. When Goldman, Spring, Kichler & Sanders LLP approached MediaTown Marketing, they were interested in a complete website redesign. MediaTown was charged with the task of creating a site that provided an exceptional and unique user experience, and to implement a brand strategy reflective of the firm’s prominent presence in the field of real estate law in Toronto. With the guidelines set, MediaTown went to work. The MediaTown team designed and provided professional site architecture, complete with calls to action, and social media integration. The Goldman, Spring, Kichler & Sanders LLP website is now the all-in-one sales tool, used to attract prospects, and nurture these prospects into customers.